Marco came to America to play college football and got more than he bargained for. 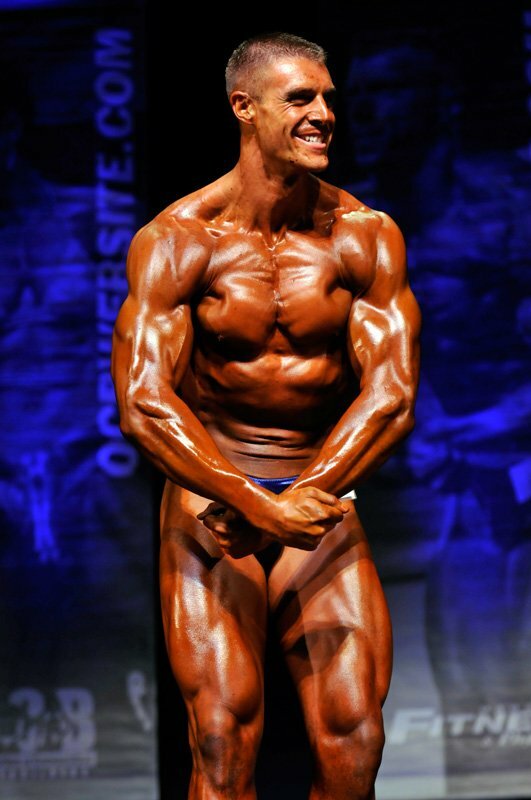 He became infatuated with bodybuilding and is proud to be assembled in the U.S.! I've been involved in sports and working out for more than a decade and developed a passion for lifting weights during this time. Born and raised in Germany, I started playing American football for a local German team when I was 15 and began lifting weights around the same time to improve my performance on the field. Five years later, I earned a full football scholarship to the University of Delaware and moved to America. Lifting weights was essential to develop the strength and speed needed to play division 1 football. When my football career ended, staying in shape took over and the gym became more and more important. Unfortunately, at that time I had no clue about the importance of proper nutrition and continued with my old football workout plans without a proper meal plan. The result was a drop in weight of almost 50 pounds at the expense of muscle mass and strength. In February of 2011, I decided to get serious about health and started researching diets, supplements, workouts, and techniques. I started reading articles that were weight training and diet related and documented the progress with pictures, instead of relying on the scale. A solid workout plan combined with the right diet brought results. Within six months, I regained 20 pounds, dropped my waist size by three inches and reduced my overall body fat. Bodybuilding took over my life and I started looking into competitions. My exceptional height of 6-foot-8 and long wingspan were a great advantage when it came to playing offensive tackle, but it's pretty much the opposite for bodybuilding. Filling out a large frame with lean mass requires serious work and time. However, after some major gains this past winter and with a good portion of rediscovered self-esteem, I decided it was time to show the results of my hard labor and entered the NPC Philadelphia Championships this year. Since I'd never done a show before, everything from strict dieting to posing was a complete new experience for me. I only placed so-so at that event, but I'm completely hooked and can't wait to get on stage again. I've used several different workout plans over the past decade, but the one that worked best for me was last year's off-season plan. The plan is pretty basic, but was very effective for me combined with the right diet. This diet was specifically developed based on my body weight and body fat content. I am preparing for my next competition, so I follow a low-carb, high-protein diet. The nutrition plan that worked best for me was the diet I followed last winter. It's split into workout and non-workout days and resulted in a 20-pound gain of lean muscle mass. Besides the usual suspects like BCAAs, glutamine, creatine, and whey protein, I had great experiences during the off-season with Gaspari products, especially SuperPump, SizeOn, and Vasotropin. I like that bodybuilding is more than just a sport, it's a lifestyle. If you're serious about bodybuilding, your entire life will evolve around it. It affects your social life, family, and job. Bodybuilding is one of the very few sports that truly appreciates the hard work, dedication, and contribution of an individual. You're solely responsible for your success; you're the only one to blame for failure. You and only you can be held accountable for your actions and have to present the result on stage. My internal drive. Looking at myself in the mirror motivates me every morning to push my body and get the most out of it. A healthy lifestyle is a tool to accomplish this goal. I'm a very driven and competitive person and faced tons of adversity throughout my life. I've been told numerous times that something wasn't possible or couldn't be done. I challenge myself to accomplish it and prove the naysayers wrong. I am planning on competing in two more events this year, the 2012 NPC Delaware Championships and the OCB Mid-Atlantic's Battle for the Belt, before starting my "off-season" and working on adding more mass to fill up my large frame. My goal is to compete 15 pounds heavier next year and become a more serious competitor. "Never trust a skinny chef." Be careful where you get workout and diet tips from, who you ask for advice, who's giving you advice, and from whom you finally take it from. Your source, no matter if it's an actual person, a website, or a book, should be reliable. Arnold Schwarzenegger, Lou Ferrigno, Markus Rühl, and Ralf Moeller. I'm a big fan of Bodybuilding.com's articles on workouts and nutrition. The entire site has played a major role to get me where I am today.